Ibanez ES2 Echo Shifter Review - Best Analog Delay Pedal? 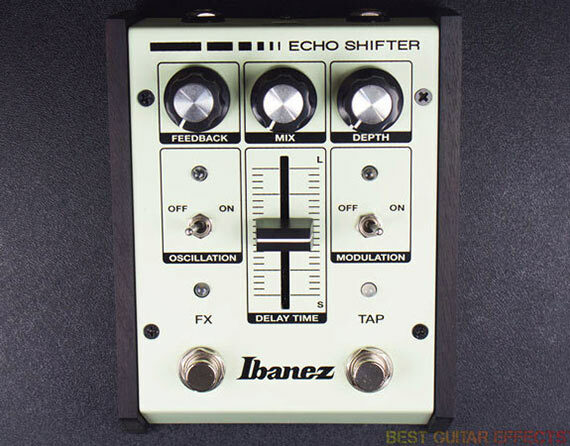 Ibanez ES2 Echo Shifter Review – Best Analog Delay Pedal? Aside from the almighty Tube Screamer family of pedals (including the Tube Screamer Mini, TS808HW, etc.) and perhaps some other classics like the SD9 or old Standard Fuzz, Ibanez aren’t exactly known for too many offerings in the pedal realm. Partly for that reason, the ES2 Echo Shifter runs the risk of flying under the radar a bit, especially since it doesn’t seem to be part of a long-running series of pedals like the Tube Screamer and its assorted variations. But with a full analog signal path, tap tempo, modulation, and a unique styling (a rare set of features for such a relatively affordable delay pedal), the ES2 has the potential to be a serious contender in today’s analog delay pedal market. From a designer’s perspective, incorporating a digital circuit, such as a tap tempo, to control certain parameters within an analog design can be a bit of a hassle, not to mention costly. While digital control and tap tempo have long been less common on analog delays, such implementation adds a lot of versatility. Therefore, the ES2’s main selling point is the fact that its signal path is completely analog, while also featuring a tap tempo. Analog delays aren’t exactly known for being capable of long delay times either, but the Echo Shifter offers a surprisingly long 1000ms, which is certainly plenty for most applications. Another characteristic of analog delay pedals that could be considered downside is that the repeats generally are somewhat noisier and definitely color the tone, not unlike the treble roll-off of a tape delay. This is obviously a matter of taste, and most people are aware that an analog delay is not the best choice when crystal clear repeats of the original sound are desired. Although I couldn’t directly confirm this, I suspect the unit uses the standard buffered bypass circuit featured on most Ibanez guitar pedals, a solid choice in my opinion. As far as the usual stuff goes, there is a clear white status LED above the on/off foot-switch (labeled ‘FX’) on the left, as well as a green (red while tapping) tempo indication LED above the tap tempo foot-switch which is nothing out of the ordinary, but I really appreciated the orange LEDs to indicate the status of both the modulation and oscillation toggles, definitely handy on a dark stage. Another major way the ES2 distinguishes itself is by the vintage styled wedge shaped housing, finished in a somewhat greenish white, with old school wood side panels, a delay time slider, and big chrome-centered knobs. It’s definitely a nudge in the direction of the analog synth world and I think it makes for an attractive and unique looking pedal. As expected there’s not a whole lot of info in the single page manual. Although adequate, it’s very brief and doesn’t offer anything in the way of suggested settings. 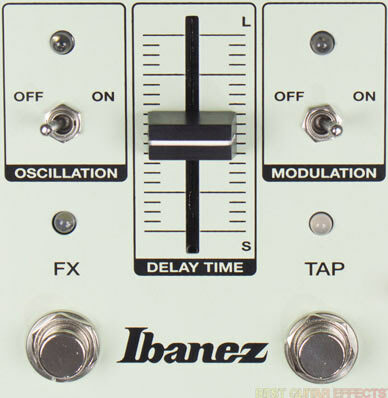 Visit Ibanez for more information about the ES2 Echo Shifter Analog Delay. The ES2 Echo Shifter definitely has character, both sonically, as one would expect from an analog delay, as well as visually. The treble roll-off caused by the relatively primitive analog bucket brigade chips (a pair of Coolaudio V3205D’s in this case) makes it quite dark and lo-fi sounding, even more so than sophisticated analog delays which generally use more expensive chips, but I quite liked how it separated my dry signal from the repeats in the overall mix and it also remained fairly noise free considering a lot of noise ‘lives’ in the treble frequencies. The layout of the controls works well, so going from a simple slapback to a more obvious delay all the way to oscillation is achieved relatively easily.Briefly going over the controls: the ‘Feedback’, also depending on the other controls, goes from a single repeat at minimum to infinite repeats anywhere past 3 o’clock. With the ‘Mix’ at the first quarter of rotation repeats are barely noticeable, but it quickly gets up to unity a little past noon, and the initial repeats get a fair bit louder than unity anywhere past 3. The ‘Depth’ control, which is only active with the ‘Modulation’ toggle engaged, is subtle until about 9 o’ clock but causes fairly heavy detuning anywhere past halfway, up to a modulating 5th above/below the original pitch at maximum, which is a lot heavier than the modulation found on most delays, further establishing the somewhat experimental nature of the ES2. The modulation isn’t particularly fast, and I would have certainly appreciated being able to control the speed as well. After flipping the modulation toggle to the ‘off’ position, the modulation doesn’t disappear straight away, as there’s an interesting wobble that occurs for a few more repeats. Moving on, the ‘Oscillation’ switch seemed a little redundant at first, since the ES2 is capable of oscillating even with the toggle turned off as long as the ‘Feedback’ is at or near maximum, but it speeds up the process, so that within a couple of repeats the relatively low headroom BBD chips overload and the repeats are distorted quite heavily, quickly turning your repeats into an epic wall of noise. The other controls do still retain their functions while the ES2 is oscillating: turning the ‘Feedback’ to minimum stops the oscillation completely, while the ‘Mix’ simply controls the volume of the wash of noise behind your dry signal, which makes the whole thing a lot more manageable than expected. The ‘Oscillation’ still modulates the pitch, while the ‘Delay Time’ slider (or tap) permanently change the pitch, causing that typical warping sound for even more craziness. The highlight of the pedal overall is the ‘Delay Time’ fader, partly for the novelty factor, but controlling the delay time this way is surprisingly intuitive, as it allows for more instant and detailed control. As far as downsides go, in spite of the ES2 being buffered bypass it unfortunately doesn’t let the repeats trail off after the pedal is disengaged. Instead the repeats get cut off immediately, which is a serious downside if smooth transitions are what you’re after. But there may be being a technical reason for this, since delay oscillation can get really loud quite quickly, and most people’s panic reaction would be to switch the pedal off when things get too crazy, it might have been designed this way to prevent amps from blowing up. In short, a (perhaps internal) toggle switch would have been nice to allow delay ‘spillover’. Another minor issue is that the foot-switches feel a little too squishy, are somewhat noisy (mechanically, not electronically), and have a fairly low profile. However, my biggest issue would be regarding the tap tempo; it does what it’s supposed to as long as the pedal is engaged (it overrides the slider setting until it’s moved), but it doesn’t retain the ‘tapped’ tempo as soon as it’s bypassed, simply reverting back to the setting of the slider, and it doesn’t register a new tempo being tapped while the pedal is disengaged either. These are fairly essential features for most people looking to use delay in a more discreet fashion. It’s also relatively bulky, taking up a fair amount of space, although this can be a good thing when making adjustments on the fly, and even allows for moving the delay time fader by foot, a nice alternative to the tap tempo, although I’d be wary of putting too much pressure on it. The quirky enclosure does make for a somewhat crude battery compartment, similar to that found on old RAT pedals, with a door that’s held in place by a thumbscrew, which happened to be quite tough to unscrew the first few times. It’s Ibanez, so it’s sturdy and it works as expected. It has more of a mass produced feel to it, but it certainly looks eye-catching and has a unique character visually and sonically. It would be nice to see a premium version with more features (tap divisions?) and its few issues addressed. 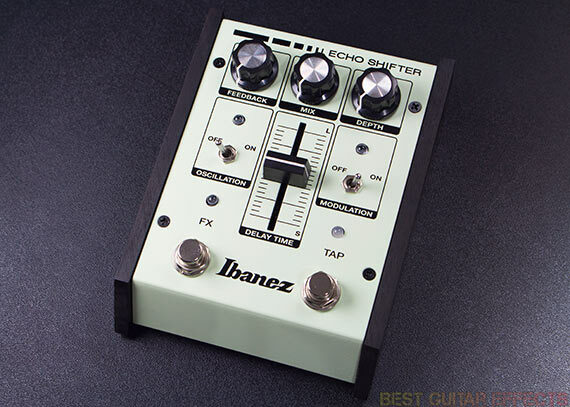 The Ibanez ES2 Echo Shifter is a great fully analog delay pedal with tap tempo at a very competitive price. The ES2 makes a decent traditional delay as well as something I could see myself using in more experimental setups, due to its extreme modulation and wild, yet highly controllable oscillation. There are some quirks not everybody might be able to live with, the somewhat limited tap tempo functionality being the biggest one, and it might not be anything special in terms of build quality or reliability. While this might make it somewhat delicate for the road, the ES2 would be an inspiring creative tool in the studio. I definitely enjoyed this inspiring piece of gear, and I would love to see Ibanez design more pedals in this vein, using similar cosmetics paired with old school (analog) designs. That concludes our Ibanez ES2 Echo Shifter Delay review. Thanks for reading. 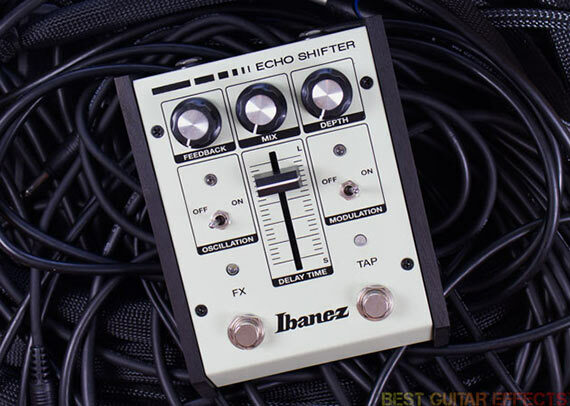 Want to buy the Ibanez ES2 Echo Shifter? There’s a little bit of deception going on with this pedal: the audio path is not entirely analog. There’s a DSP chip that converts the signal to digital before the tap tempo circuit and then back to analog afterwards. Just thought your readers should know.